It’s 5am, and I’ve begun Father’s Day by driving 95 mph drive up the highway, frantically juggling coffee, sunscreen, and a race number that refuses to pin itself straight. Wait…isn’t Father’s Day supposed to be a day of rest? The one day every Dad can sleep in, waking only for the smell of pancakes from a kid-filled kitchen or the sunrise nudge-nudge of a willing partner? 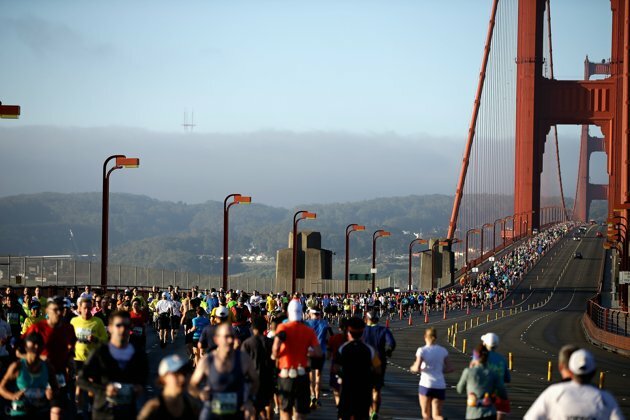 Well, not if you’re a runner and the 12th annual San Francisco Marathon starts in 45 minutes. You don’t miss that, even if your 2-year-old sabotaged your alarm clock (Happy Fadder’s Day, Daddy!). I screeched into a parking space and hustled to the starting line, just in time to see Wave 1 headed the other way. Oops! 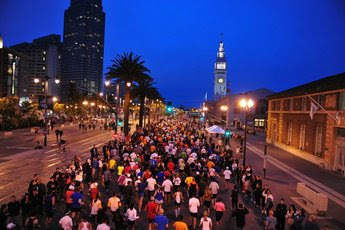 Luckily, the SF Marathon is such a polished event these days that D-Tag’s are standard, and they happily escorted me to the Wave 2 corral. The bulk of the ~6,000 runners were in this group, and everyone was stoked that the weather was an ideal 60 degrees and sunny. They counted us down, and we were off! We departed the Ferry Building, and watched the sun come up as we cut through Fisherman’s Wharf and the Marina. It was nice to be forced into a leisurely pace and NOT have a plan, if anything just to be reminded that this iconic city is right in our backyard. 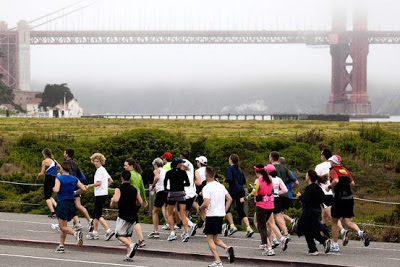 And today, it belongs to the runners! When my GoPro Camera died in the first few miles (I call it the GrrrrPro camera now thanks to the unpredictability of the battery charge), the only thing left to do was be present and enjoy the tour. 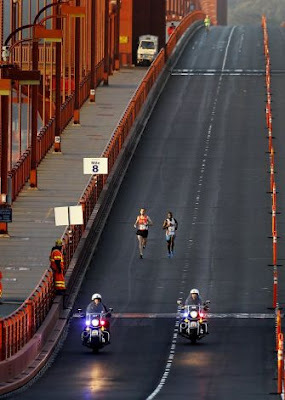 As we cut across the Golden Gate bridge, I could see French runner Francois Lhuissher and Ismail Ssenyange from the UAE shoulder-to-shoulder at a 2:25 marathon pace , with former winner Michael Wardian (no longer in Hokas!) just a minute behind. 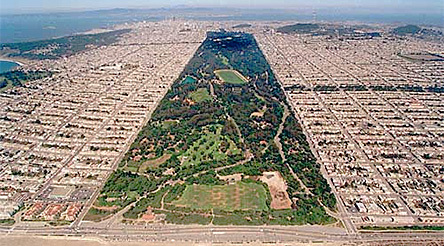 How do they do that on such a hilly course?!? Soon after I saw a stream of familiar faces – Anna Bretan (who I met at her marathon debut when she won the 2011 Oakland Marathon), Devon Yanko (somehow fitting this in with her 100-hour workweeks launching the best new café and bakery in San Anselmo), Ian Sharman (fitting in one more 2:45 marathon in prep for Western States), Bill Dodson (age 78, on a sub-4 hour pace…dude! 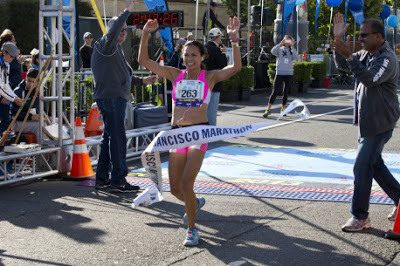 ), Guillermo Gonzalez from Mexico (and the Masters record holder with his 2:33 from last year), super fast Penny Macphail (will she learn from the Oakland Marathon and go slow enough to win her age group? ), and more. Everyone was smiling and waving, and enjoying watching the sun come up over Alcatraz Island. As we came back across the GG Bridge and entered the hills of the Presidio (mile 7), my warmed up legs wanted to take it up a notch, so I kept the pace around 6:10-6:30 min/mile and slowly worked my way up through the crowd. The locals were out and cheering like mad, and the volunteers kept the frustrated drivers at bay for us at every intersection. By the time we entered Golden Gate Park (mile 10), SF was fully awake! Such a peaceful park in the morning. I found myself running alone through the Mission (mile 21), smiling as my mind swirled with the joys of fatherhood. That sense of awe that fills every day, the constant reflection on the past that comes with a commitment to the future, the little victories that make big ones truly feel momentous. Such a crazy and rewarding experience, especially now that my girls (6 and 2) are becoming lively and uncontrollable characters. I hear their laughter among the crowds lining AT&T Park (mile 25), but know they are still snug in their beds. Their laughter pours endlessly into my heart like a mountain spring. 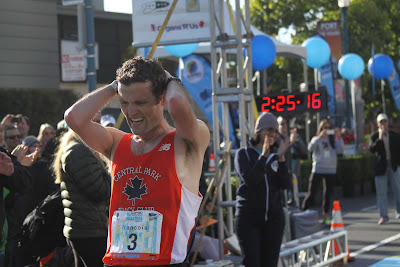 I snap out of my daze as I pull up to the familiar face of Charles Wickersham, who is just realizing he is about to clock his first sub-3 hour marathon. Charles kicks it into high gear, and pulls me through in 2:56:21, good enough for 39th place and 2nd in my age group. The beer tent is right at the finish (nice touch!) and I waste no time replenishing my carbs, giving an extra toast to the Dads crossing the finish, and one extra for my Dad who is somewhere riding his bike across Oregon. A great race, a gorgeous day! Michael Wardian (3rd today in 2:30:18) and Ian Sharman (16th in 2:45:38, AG win) are at the elite finish tent, and we all load up on great food from Perry’s Embarcadero. Francois Lhuissier (1st in 2:25:15) is heads down on his phone, texting his NYC buddies about his win, while Devon Yanko (2nd in 2:52:57) gets a massage and has nothing but great words of encouragement for Anna Bretan (1st in 2:42:26) who swiped Devon’s CR by less than a minute. I rotate in to the post-race massage, taking a little nap as they work their magic. All in all, a perfect way to start the Father’s Day celebration! My thanks to the race organizers, volunteers, SFPD, sponsors, and people of SF for a fantastic excuse to see the best of this great city. I will see you again next year! 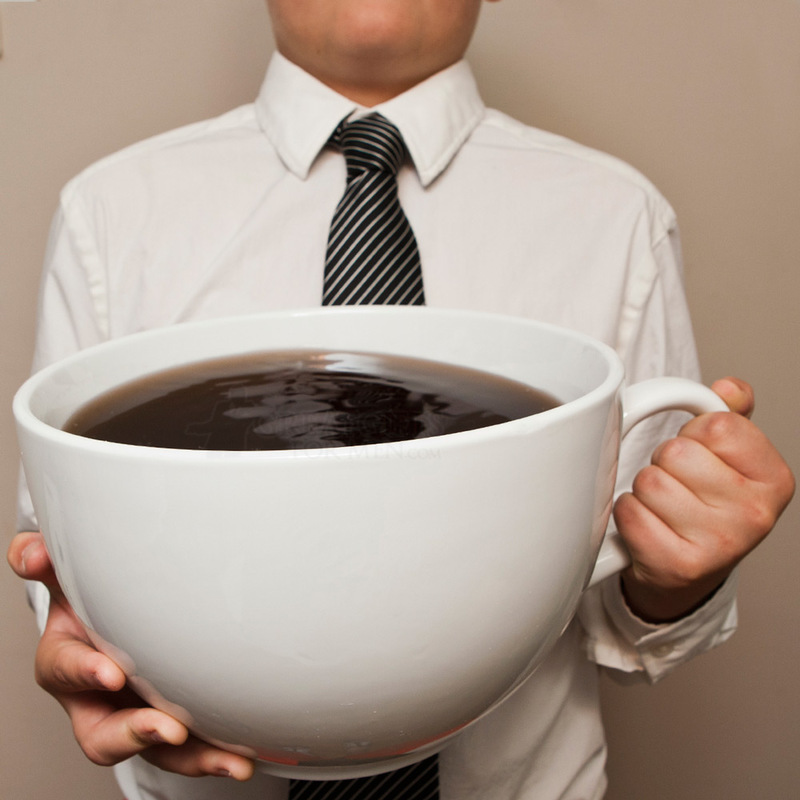 Re-reading this great summary of studies of the effect of caffeine while I get my pre-run second cup. Here I thought it just tastes good, but apparently it can help stave off dementia, reduce your risk of cancer, and improve memory development in low oxygen environments (weird, I know...you have to read the article). Sweet! 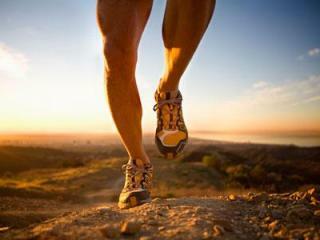 We all know we generate energy with every strike of the foot while running - is it possible to harness that power? A group of students at Rice University in Texas certainly think so, and have created a prototype that can harness enough energy from a heel strike to power a small electronic device. Check out the video below - I get the feeling they are onto something pretty cool, particularly in this era of the quantified self.